4 Why not use JPG or PNG files? This guide will show you how to export textures properly for BeamNG.drive. Almost every texture should be exported as a DDS (DirectDrawSurface) file. The big advantage of DDS files is that they can be decompressed by the hardware (GPU in this case) and are therefore faster to load. They can also automatically create mipmaps which are used to interpolate the textures properly to a lower resolution. 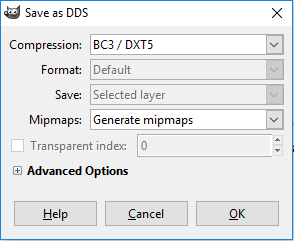 You can force your image editor to use a special compression type when exporting your texture as a DDS file. For a color map without an alpha channel. Use this format if your texture has no transparency. This type contains 5 bits for the red, 6 bits for the green and another 5 bits for the blue channel per pixel. For color maps with an alpha channel. Use this format if your texture has transparency. Like BC1, this type contains 5 bits for the red, 6 bits for the green and 5 bits for the blue channel per pixel. Additionally, it includes 8 bits of alpha channel information per pixel. This type only contains two color channels: red and green. Each of these contain 8 bits per pixel. The missing blue channel will be calculated within the engine. The texture compression format newly supported starting from version 0.15. Should be the preferred format for all textures except normal maps. Results in more detailed textures on-screen. TODO: Describe this format more. 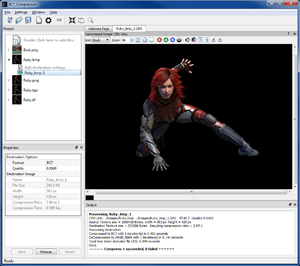 You may need to install a plugin for your image editor to be able to export DDS files. Paint.net includes a DDS exporter by default. Unfortunately, it doesn't contain the BC5/ATI2 compression type and therefore it's not capable of exporting proper normal map textures for now. Why not use JPG or PNG files? These are both compressed image file formats as well. The problem is that your graphics card is not able to decompress these kind of files by itself. Your CPU needs to decompress them first and then upload them to the GPU. This would artificially increase the render time. Besides that, DDS files commonly do have a lower file size than JPG and especially PNG files. At some point in the future, BeamNG.drive will only support DDS textures.